We get asked repeatedly many of the same questions regarding Swarovski product and its unique terminology. This Swarovski Terminology section is our attempt to demystify the less commonly known or confusing Swarovski terms or abbreviations. 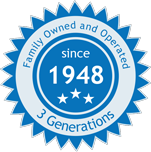 If you have any questions that are not represented below, feel free to contact us at any time (631-756-9800). What is the difference between hot fix and no hot fix rhinestones? What is the difference between top and bottom coatings? What is a Lacquer coating? What does "V SI" after a coating mean? What is the difference between Shimmer, AB, 2X and Full Coated? What is a "Protective Layer" noted as "P" after a coating mean? What does it mean if the product style # has a /2 or a /4 after it? What does it mean if the product style # has a "G", "B", "H" "I" "S" or "C" after it? What does PP, SS, and MM mean in sizing? What is the "Core Assortment"? Swarovski's No Hot Fix Rhinestones are also referred to as Flatback Rhinestones. Flatback rhinestones usually have a foiling on the back, unless specifically noted as "unfoiled". Glue is applied manually to the back of the stones to adhere to many different types of materials including but not limited to fabrics, paper, metal, wood, and plastics. Swarovski's Hot Fix Rhinestones are virtually the same as non Hot Fix stones, except they have a heat activated glue already adhered to the back of the rhinestone. Hot Fix stones are exclusively used on fabrics (tip - will not work on waterproof fabric!). The glue works by applying heat to the stone with the use of an iron, a BeJeweler, or a Hot Fix machine. As long as the rhinestone has been applied properly with the correct time, pressure and temperature, the stone will remain adhered to your fabric. Note: Swarovski has changed their glue over the years. On newer hot fix stones, the glue will appear transparent. On older stones, the glue will appear as an opaque grey. Both work equally well. For more specific information on the application of hot fix stones please review the Swarovski Application Manual: Hot Fix Application. 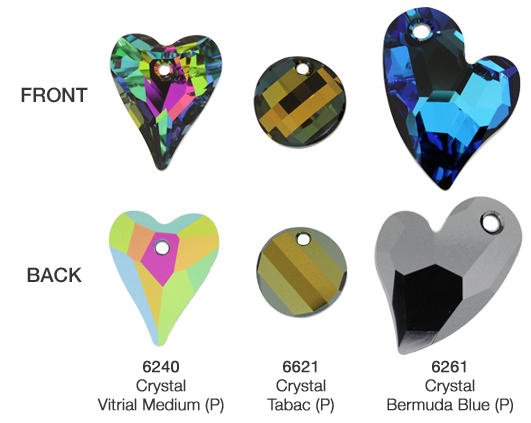 For more general information on understanding hot fix stones and their application, please review our page dedicated to How to Apply Swarovski Hot Fix Rhinestones: http://www.harmanbeads.com/understanding-hot-fix. A gross is a quantity of 144 pieces. A gross is ALWAYS 144 pieces. If a product is sold in multiples of a gross, like 2 ½ gross, then the quantity is 144 X 2.5 = 360 pieces. If a product is sold in a fraction of a gross, like a ½ gross, then the quantity is 144/2 = 72 pieces. Please see view our Conversion Chart for Gross, Dozen and Pieces. Click here to view the conversion chart. In order to help you figure out how much you need to purchase, please use our exclusive HarMan Importing Swarovski Crystal Quantity Calculator. Enter in the numbers below to find out the quantity equivalents in gross, dozen or pieces. Click here to view all Swarovski products. Partial packages are available for select crystals. Coatings that are applied to the top of a stone are referred to as Surface Effects while coatings that are applied to the bottom of a stone are referred to as Translucent Effects. Surface Effects are the most common type of coating and means that the coating that is applied to the top surface of the crystal. Examples of such coatings are: AB (Aurora Borealis), Shimmer, Antique Pink, Astral Pink, Blue Shade, CAL (Comet Argent Light), Copper, Dorado, Golden Shadow, Hematite, Iridescent Green, Lilac Shadow, Luminous Green, Metallic Blue, Metallic Light Gold, Metallic Sunshine, Moonlight, Nut, Paradise Shine, Red Magma, Rose Gold, Satin, Silver Shade and Transmission. Translucent Effects are applied to the bottom side of the crystal and the properties of the coating flows through the crystal itself. Examples of such coatings are: Bermuda Blue, Heliotrope, Meridian Blue, Silver Night, Tabac, Vitrail Light, Vitrail Medium, and Volcano. Crystal Lacquer Pro Effects is a premium opaque varnish that is applied to the reverse side of the crystal instead of foiling, resulting in an opalescent appearance. This innovative process allows for the production of colors with an intense vibrancy to subdued neutrals unable to be produced through traditional methods. They are only produced in flatback rhinestones, round stones and fancy stones. The color palettes produced were designed to work together for harmonious color design. DeLite Lacquer Pro Colors takes Lacquer Pro colors to the next level. The DeLite collections of colors are made with the same premium opaque varnish that is applied to the bottom of the crystals, but is also includes 2 additional features: 1) An additional “Shimmer” coating applied between the varnish and the crystal creating beautiful and unique illumination and color variation and 2) Additional highlights are added to the facets designed to enhance the depth and clarity of the crystals allowing them to appear sharper and more perfect. Think of the "V" as if it means "inverse" or "reverse". The coating that it is associated with is on the inverse side of the crystal than it otherwise would be located. Often described as non-transparent, coating or foils. If a coating is applied to the top of the crystal (Surface Effect) and contains a V SI afterward, the coating is actually applied to the BOTTOM of the stone, and acts like a foiling. If a coating is applied to the bottom of the crystal (Translucent Effect) then the coating is now applied to the TOP of the crystal. Note: The most common time you will see this is with Crystal Cal V SI, but it can apply to other coatings as well, the concept is always the same. Crystal Cal F: Standard CAL coating on top of a foiled crystal stone. This will look like an opaque silver metallic stone and will also be foiled. Crystal Cal SI: The Standard CAL coating is now applied to the top of the stone and therefore shows as an opaque silver coating. The back of the stone is transparent without any foiling. This version is less common. Crystal Cal V SI: The Standard CAL coating is now applied to the bottom of the stone and acts as a mirrored foiling. The stone itself looks exactly like crystal foiled. The coating effect referred to as AB is also referred to as "Aurora Borealis". It is a rainbow / iridescent effect that is applied to either the top of a stone or to half of a bead or pendant. Aurora Borealis is one of the most well-known and popular effects from Swarovski. Fun Fact: The iridescent AB coating was created in 1965 amidst a collaboration between Swarovski and renowned fashion designer, Christian Dior!! The effect was achieved when a very thin layer of gold was vacuum-coated onto the surface of the crystal. They felt that the effect was similar to viewing the Aurora Borealis, the natural light display in the sky around the northern hemisphere. Fun Fact: The Shimmer coating was invented by Swarovski in 2016 originally to meet the demands of the dancesport industry. 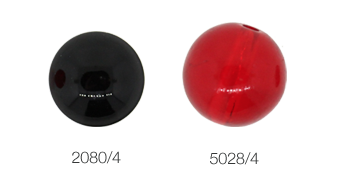 Full Coated, or "FC" is the same as the 2X, in that the AB coating is applied all around the bead, but it is applied with an improved technology and offers a higher intensity AB effect. To date, the Full Coated AB effect is only available in Swarovski's round bead, style 5000. A protective layer is a special transparent lacquer that is applied over translucent (bottom) coating effects. This is most often seen with Swarovski Pendants and Beads. The lacquer is designed to protect the coating effect from scratches, fingerprints, and other damage. It also prevents moisture from penetrating the coating which can lead to corrosion. When you see a "P" noted after a color, it is because that color has a protective layer applied over the coating effect. Because the protective layer is of such high quality and made of advanced technology, products with a "P" coating are more expensive than standard coatings. 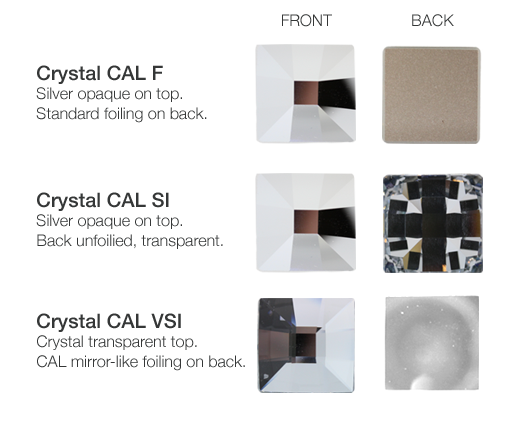 Examples of coating effects that may be available with a protective layer are Crystal Bermuda Blue, Crystal Volcano, Crystal Tabac, Crystal Comet Argent Light, Crystal Vitrail Light, and Crystal Vitrail Medium. The /2 or /4 after the style # is actually part of the style number itself. Note: Most products using table cut stones are not eligible for use in the Swarovski Branding Program. What does it mean if the product style # has a "G", "B", "H", "I", "S", or "C" after it? There are some products which are partly frosted that do not have a /G after it. While these products are in fact partly frosted, they do not have /G after the style number because it is the smooth, unfaceted part of the crystal that is frosted and there is also no non-frosted alternative. A little technical… we know. A "B" after a Swarovski style number indicates that the specific item is a "Marbled" color. These colors are opaque and give the effect of a natural stone. There are only a handful of "Marbled" colors: Marbled Blue, Marbled Black, Marbled Grey, Marbled Terracotta and Marbled Yellow. Marbled colors are available in Swarovski 2058 Xilion Flatback Rhinestones. An "H" after a Swarovski style number indicates that the style is comprised of a crystal encased (or "framed") in a metal ring. The metal component is made of brass and then plated with either silver, gunmetal or gold plating. (Example: 2078/H is the "framed" version of the 2078 Hot Fix Rhinestone – this is the upgraded version of the Ringed Roses). An "I" after a Swarovski style number indicates that the style has a metallic coating around the rim, or edge of a rhinestone. Usually only available in a Dorado Rim (illusion of gold) or Light Chrome Rim (illusion of silver). The metallic coating offers an optical illusion of a metal rim with all the beauty, but with no actual metal. An "S" after a Swarovski style number indicates that the style is a brass setting for a Swarovski fancy stone. For example, 4727/S is the setting for the 4727 fancy stone. To shop Swarovski settings, click here. A "C" after a Swarovski style number indicated the style is Fancy Stone Setting, available with either one or two loops (or both). The setting is designed to be used with a Swarovski Fancy Stone. For example, 4775/C is the setting for the 4775 Swarovski Eye Fancy Stone. To shop Swarovski settings, click here. 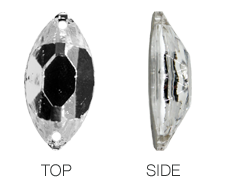 PP, SS, MM are the standard measurement abbreviations used to indicate the size of Swarovski crystal styles. Fun Fact: The history of the term "Pearl Plate" is that back in the day, pearls were placed into a stacked series of increasingly sized metal plates with holes in them. The pearls would then fall from plate to plate allowing for the correct sizing and separation of pearls. SS stands for "Stone Size". SS sizes are used exclusively for Swarovski round stones and flatback rhinestones. MM stands for "Millimeters". Swarovski always allows for a variance when defining millimeter sizes. So, an SS12 stone is approximately 3.00 to 3.20 millimeters. Please view our Swarovski Size Reference Chart to view the sizes and how they relate to each other. Note: The Advanced Crystal is not noticeable to the eye! For more specific information on "Advanced Crystal" and Swarovski lead free products, please review our Swarovski's Advanced Crystal – Lead Free Section. In the fall of 2018, Swarovski crystal released the Core Assortment. What this means is that all items included in the “core assortment” will always be available and stocked by Swarovski in high volume. The Core Assortment spans across most product lines and includes 7 of their classic colors, Crystal, Light Colorado Topaz, Scarlet, Amethyst, Aqua, Emerald and Jet. The program was designed to simplify and speed up the process of choosing and ordering Swarovski’s most popular precision-cut crystals. This expanded color assortment in Swarovski’s best-selling and basic styles allows the designer to design using a variety of crystals in one particular color. Click here to view all the items in the Core Assortment.